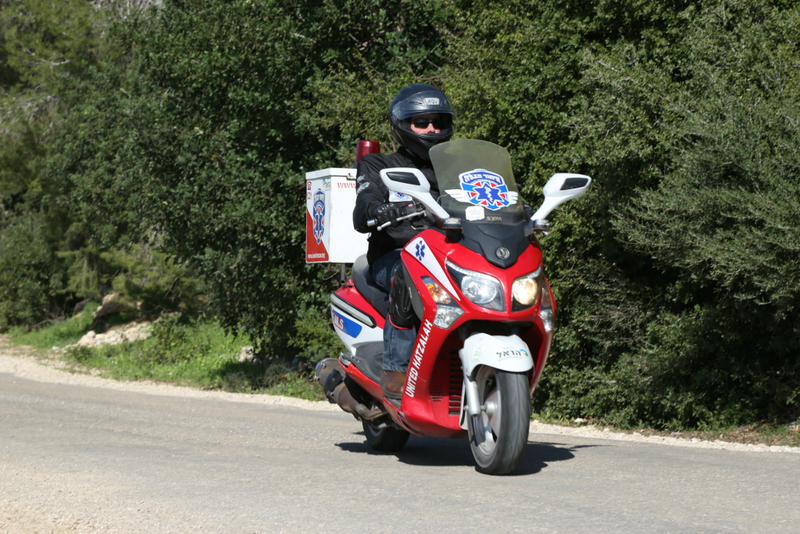 Aviad Ketabi is a United Hatzalah volunteer who is very active in Hadera where he lives. A busy father of 3, Aviad is a veteran of Sayeret Matkal, an elite unit in the IDF. Throughout his military career, the soldier was involved in complex undercover missions. The young man saw compatriots killed and badly injured in the course of duty. In memory of his fallen comrades, Aviad vowed to enroll in an EMT course, pursuing the critical training necessary to save lives. He now races out to frequent medical emergencies as a volunteer medic with United Hatzalah. Last Shabbat, Aviad responded to 14 incidents. One of those calls highlights the impact that Aviad is having on his community. It was midnight when Aviad awoke to the insistent buzzing of his United Hatzalah radio. United Hatzalah dispatch was alerting him to a childbirth in progress right near his own home. The devoted EMT leaped out of bed, raced out to his ambucycle and sped to the location through the chilly weather on the darkened streets, arriving first on the scene. Aviad grabbed the birth kit from the back of his ambucycle and ran inside. The distressed mother was relieved to see that help had arrived so fast. The woman’s water had broken and the baby’s head was beginning to crown. Aviad coached the young woman through the final stages of childbirth until he was cradling a newborn baby boy in his hands. The United Hatzalah medic cleaned and warmed the baby, assisted the young father in cutting the cord, completed an initial APGAR assessment and congratulated the overjoyed parents. The Mobile Intensive Care Unit finally arrived 20 minutes later, taking both mother and son to the maternity ward at Hillel Yaffe Hospital for further observation. Aviad was invited to join the grateful parents 8 days later, as a guest of honor at the baby’s brit milah ceremony. This entry was posted in Uncategorized and tagged baby, birth, EMS, EMT, IDF, United Hatzalah. Bookmark the permalink.